TORONTO — Actors Robin Tunney and Breckin Meyer have worked together twice now, and in a strange twist of fate, both times have involved a notorious figure: O.J. Simpson. Their first project together was the 1996 supernatural horror film "The Craft," and the two recall filming it during Simpson's sensational murder trial in Los Angeles the year before. The former football star was found not guilty of the slayings of his former wife, Nicole Brown Simpson, and her friend Ronald Goldman. But he was eventually found liable for damages in a civil trial. "Everybody was talking about it, it was such a hot topic," Tunney, whose other credits include "The Mentalist" and "Empire Records," said in an interview. Now, Tunney and Meyer are once again steeped in discussion about the case with their new series "The Fix," which is co-written and co-executive produced by lawyer/author Marcia Clark, who was the lead prosecutor on the '95 Simpson trial. Debuting Monday on CTV and ABC, "The Fix" has shades of the Simpson case with Tunney starring in a role inspired by Clark. She plays Maya Travis, an L.A. district attorney who fled the spotlight after a career-crushing defeat when prosecuting an African-American movie star for double murder. Eight years later, she is lured back to tackle a case involving the same actor, who is now under suspicion for another murder. "The show asks, 'If you can have a do-over, what would you do different? And what lengths would you go to, to get the result you think is just?'" said Meyer, who plays the district attorney. Adewale Akinnuoye-Agbaje co-stars as the accused actor, Sevvy Johnson. Canadian-born Larysa Kondracki directed the pilot. "Marcia never practised law again, so my character (initially) is the same way," Tunney said. "The case broke her and (Maya) comes back because it's the right thing to do and that's how she's hardwired." Tunney emphasized her character isn't a carbon copy of Clark but noted she has some of her qualities. Clark was also on set every day to advise her and the crew. "I asked her so many questions, personal things, like 'What was your childhood like? What nervous ticks do you have?' Usually as an actor you have to write your own backstory, but I was like, 'I'll just borrow hers.'" Tunney said she remembers "feeling really disillusioned about the American legal system" during the Simpson trial, noting Clark felt she was treated "really unfairly" by the judge and media. 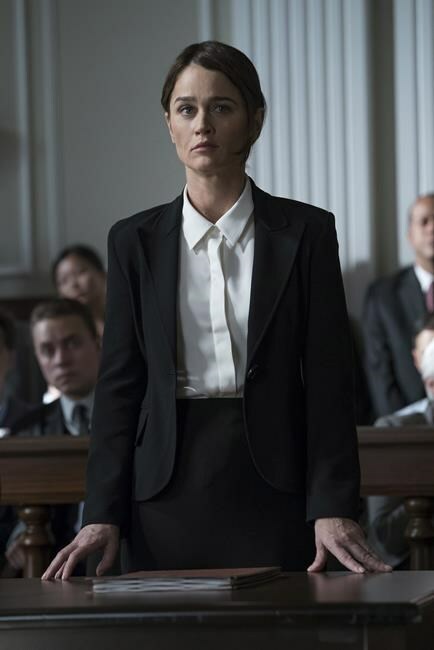 Clark became more "humanized" in the public eye when she was played by Sarah Paulson in the 2016 series "The People v. O.J. Simpson: American Crime Story," she added. "It wasn't something I think she ever thought she was going to experience, how that scrutiny and criticism can really eat you alive," Tunney said. Tunney said she considers it "an honour to find a role that is a complex woman in her 40s who's smart." The actress also identifies with her character's compulsion to return to a career path she once swore off. "After I finished 'The Mentalist,' I had a baby and I was like, 'I am never doing episodic television again. It was exhausting, I have my baby now, I'm going to stay home, I'm going to grocery shop and cook and I'll go to Mommy and Me classes,'" Tunney recalled. "And I got there and I'm like, 'Oh my God, all these women know all the words to these baby songs. How do they know the words to all these baby songs?' And they had like Tupperware that was perfectly prepared and I was like, 'I think I need to go back to work, this isn't exactly me.' Because what I do is a big part of me and I think it's the same for the character. "She knows she's walking into fire and she just can't help it, because it's who she is. So I kind of felt the same, 'I'm about to walk into fire.'"